Welcome to the Expat Diaries! I'm glad I get to be a co-host with Chelsea and Rachel and I am looking forward to reading other people's stories. 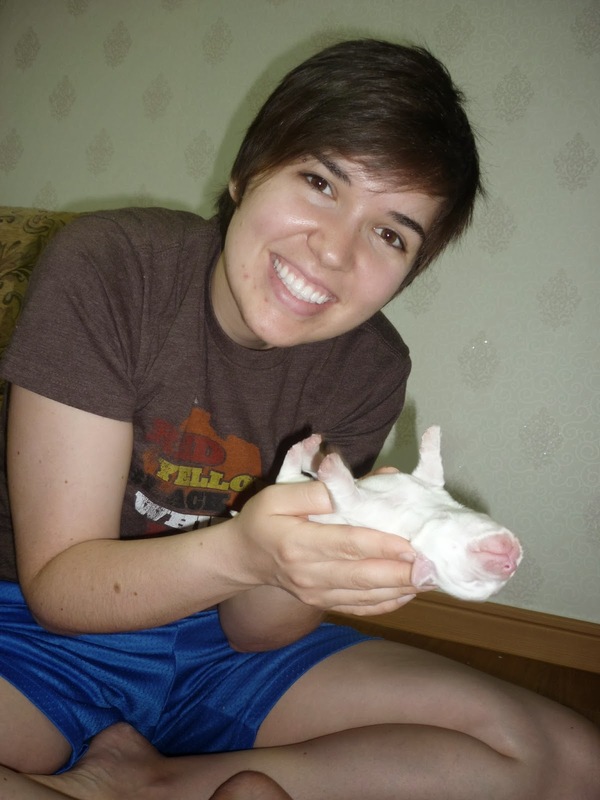 Today I'm going to share with you about how I stole rescued a dog in Korea. It all began on the daily walk to work as Alisha (my roommate in Korea) and I would walk past this odd building. The width of it was concrete but the length was glass giving us full view into a room full of little dogs. At first we thought they were food for the restaurant nearby but we quickly learned that they were too little of dogs to be eaten (apparently they only eat the big dogs...). The dogs belonged to the owner's of the nearby restaurant and those same owners also owned our apartments. The owner began to let the dogs out for a bit in the mornings. Some were nice and some were vicious (one snipped at my ankle .... scary!). Either way it was fun to see them and to interact with our apartment manager. One day we came out and there was this nice little white dog. She was so friendly and after a few days she began walking us to school. She immeditaely stole our American hearts. but I'm not a sap for pets and there was no way I was going to bring some foreign dog into my apartment. Alisha knew this too and I think we just had an understanding that we couldn't bring the dog home. After walking home from a late day at work I couldn't help but look at that little white dog stuck in the tank with the little mean dogs and ... you know, I brought her up to our apartment. I'm not sure who was more surprised that I actually brought her home. No biggie though and it was just a visit, right? One visit turned into more visits and before we knew it the dog had a name - Sobe (Sobe was the name of the city we lived in so we thought that was appropriate). You all know how it goes - occasional visits quickly turn into moving in. I mean how could we not let her? She was so cute and so well behaved. Also, there was no need to discuss it with our apartment manager because little Sobe willingly would come all the way up to our 3rd story apartment and scratch on our door. It wasn't like I stole her ... she just decided to move her life up to the 3rd floor. Apparently, while we were at school, Sobe was out meeting other dogs. I think she must have met a boy dog because Alisha noticed that her stomach was getting bigger. Um ... we have a pregnant dog? She wasn't looking too big so we figured we had some time before she busted out some puppies. One Saturday I was holding Sobe and holy guacamole she peed on me! Not ok, dog, not ok! BUT guys, it wasn't pee her water broke. Alisha and I didn't really know what to do so we put her in our tiled bathroom with a towel and let her do her thing. Let me just say seeing a dog birth a puppy will make you freak out and want to barf. She also only had one puppy, which I guess is rare in dog land. 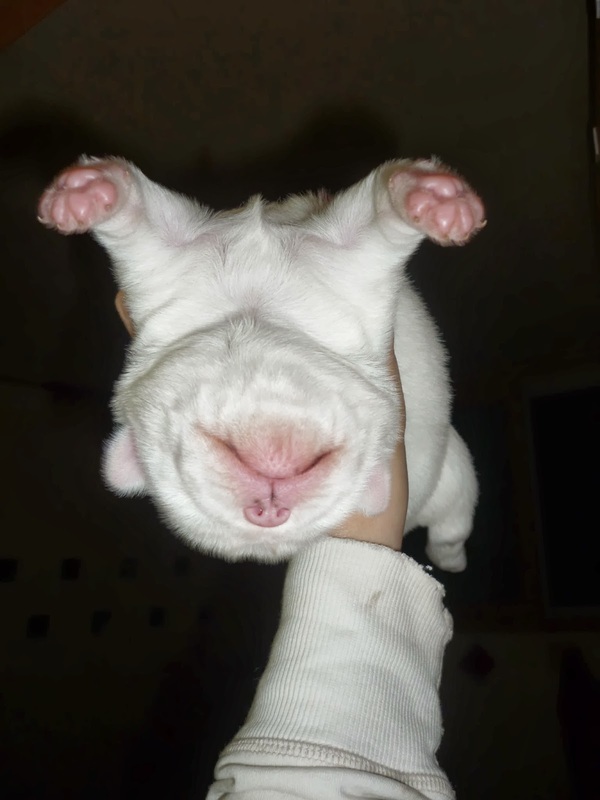 I'll spare you the 'right after birth picture' but look how little this pup is! We named her 'Rea' (short for Korea). I'd love to say we kept them both forever but one day before school I saw our apartment owner come into our office. Him and the VP were talking in Korean and I was asked if we had a dog in our apartment. I looked at her and said 'two dogs'. ha ha! They had no idea that a puppy was around. The owners told us they wanted her back because they had homes for them - which was great! Apparently 'home' was that darn dog tank. I immediately took Sobe back out and up to my apartment but the puppy was already gone. The apt manager did not love this and she told me in Korean over and over to not let the dog out. She even did some charades for me. What did I do? I gave her the 'I'm a foreigner and am confused and can't understand you look'. They soon moved Sobe away too and as much as I tried to find out where they took her I never could. They told me she was on a farm so I'm just imagining her happy and running through some green rice fields. Would you take in a dog? Am I crazy? I am an expat in Taiwan and I literally took a stray dog home from the school I work at. He lived with us for about one month before he got a forever home in Taipei. We named him Dr. Gus Bojangles. Here's a link so you can see what a cutie he was and why we just HAD to take him! oh no that's so sad! I hope both doggies are okay :/ I don't think I could handle being somewhere with lots of stray dogs - I'd want to take all of them home! Aw poor doggies. I really hope they're both ok. I would definitely take them home. I'm a sucker for a cute needy face. I hope they are ok too. Even though the dogs were 'stray' the restaurant owner would feed them every day. They were taken care of it was just different than how we do here in America. I hope they are ok too. I wonder if the puppy got sold because Korean's are partial to small white dogs. I'm glad I'm not the only one who would take a dog in. I know I can't save them all but I couldn't say no to a nice little cute one. aww - how cute!!!! i would want to take them all! & that's sad that they took them from you! Just last week we were thinking about adopting a dog here, but we realized we really aren't home that often to be able to have a puppy. We thought about fostering, but came up with the same problem. It makes me sad because there is a huge problem here, but I it's just not the right time in our lives right now. That is just adorable. I hope that they have better homes now because it would be sad otherwise. Very very cute puppy. Thanks, Cody! I hope they have good homes too. NOT crazy! What an adorable little fur-bag! There is a really good reason why dog is 'man's best friend'. Incredible creatures. I find that sometimes, when I've had a bad day, my dog is the only one who can make me feel better instantly. Don't worry - if someone, before I went to Korea, told me I was going to do that I would have said NO WAY! ha ha! It was a fun adventure. You are so right! Dogs have a gift of kindness and understanding. My husband and I share a dog with his sister and she is the best little dog ever! Your blog name / logo of +1 is super fun. I went and checked out your blog and love the concept of your name and how that came about! I think kids will be great but I'm a bit nervous because my husband and I are such travel bugs and are so independent and care free right now. However, we haven't even been married a year so I'm sure when that time comes it will all work out just fine. Thanks so much Beka. This is my first 'public' blog and I've been so amazed with the kind words and response from people. It can be nerve wracking to put yourself out there sometimes. I totally get what you're saying about kids. It does definitely slow things down a bit, but we're finding ways to continue traveling with +1 in tow (I'll report back in my blog on all that...). And then there's always Grandparents to babysit if you're lucky! Aw! I don't think I'd ever be brave enough to bring a stray-ish dog up to my apartment, but that is still a beautiful story with a kind of sad ending. I hope she is happy in the rice fields! there are strays all over in Taiwan... we've fostered two dogs but the attitude towards pets here just isn't the same as in America. I'm currently resisting the urge to take in the kitten who lives outside my Starbucks. my husband occasionally buys him a cup of milk and he looks well fed and healthy so I try not to worry. we have two cats waiting for us in the states and we travel 4 months out of the year so I just don't think it would be fair to take an animal in since we can't keep it. gah. I think the attitude toward pets in most countries are different than America. In a way I think Americans have placed so much value on animals that some have neglected people. However, I do feel bad for all the pets who don't get any attention. That's too bad you couldn't keep your puppy! I couldn't believe our dog popped out a pup either! We actually called my husband (bf at the time) on Skype because he is a PA and we figured he could help us. However, we were screaming and freaking out so much he got off skype. ha ha! Thank you for co-hosting with us!